Dental Implants are the next best thing ever to your healthy, natural teeth! Implants make it possible for people who either cannot or will not wear a conventional denture to have very firm, stable and visually attractive teeth. 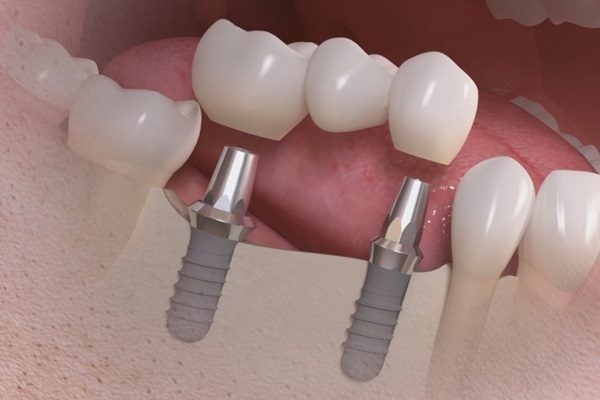 Implants can be used to replace one or more or all teeth. Our team is capable for all bone manipulation techniques and grafts for difficult implant placement cases. We are well equipped with required armamentarium. Dental implants specialists, known as Implantologists, can provide you with full mouth rehabilitation with dental implants. Dental tooth implants are the most effective way of combating the negative effects of lost or damaged teeth. Dental implants are placed on artificial tooth roots within your jawbone and replace your missing tooth root. They are custom made to suit your particular oral situation, offering a range of options for perfect compatibility. Implants are designed to replicate and feel completely natural, whilst being fully functional and preventing further tooth decay or trauma to the mouth. Titanium dental implants biocompatible materials offer durability and strength for long lasting functionality. Dental tooth implants can also prevent the repositioning of the underlying bone, which maintains your gums tissue and facial support. Most people would agree that the main benefit of a dental implant treatment comes from the permanent solution they provide to missing teeth, whilst looking and acting like your natural teeth. Although there are a number of restorative options for replacing missing teeth, none have proven to be as functional and highly effective as dental implants. Regardless of the nature of the problem related with tooth loss, a dental implant specialist can provide a simple solution with proven results. The durability and the strength of the dental implant will mean that you have long lasting effects and once again eat and speak with comfort. Let dental implants restore your confidence, by giving you a perfect smile. With poor-fitting dentures, the teeth can slip within the mouth causing you to mumble or slur your words. Dental implants allow you to speak without the worry that your teeth might slip. Dental implants don't require reducing other teeth, as a tooth-supported bridge does. Because nearby teeth are not altered to support the implant, more of your own teeth are left intact, improving your long-term oral health. Individual implants also allow easier access between teeth, improving oral hygiene. Removable dentures are just that; removable. Dental implants eliminate the embarrassing inconvenience of removing your dentures, as well as the need for messy adhesives to keep your dentures in place. Success rates of dental implants vary, depending on where in the jaw the implants are placed but, in general, dental implants have a success rate of up to 98%. With proper care, implants can last a lifetime. Many companies provide guarantee for their implant unit from 10 to 15yrs. In most cases, anyone healthy enough to undergo a routine dental extraction or oral surgery can be considered for a dental implant. Patients should have healthy gums and enough bone to hold the implant. They also must be committed to good oral hygiene and regular dental visits. Heavy smokers, people suffering from uncontrolled chronic disorders - such as diabetes or heart disease- or patients who have had radiation therapy to the head/neck area need to be evaluated on an individual basis. If you are considering implants, talk to your dentist to see if they are right for you. The first step in the dental implant process is the development of an individualized treatment plan. The plan addresses your specific needs and is prepared by oral implantologist who is specially trained in oral implantology. Once the implant has bonded to the jawbone, a small connector post - called an abutment - is attached to the post to securely hold the new tooth. To make your new tooth or teeth, your dentist makes impressions of your teeth, and creates a model of your bite (which captures all of your teeth, their type, and arrangement). Your new tooth or teeth are based on this model. A replacement tooth, called a crown, is then attached to the abutment. After the dental implant, mild soreness can be treated with pain medications.